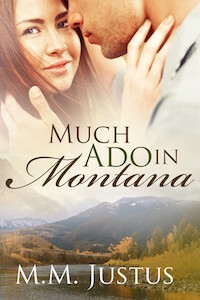 Much Ado in Montana is a contemporary romance, written because I’ve always loved the Shakespeare play and wanted to do a pastiche, set in Montana because I lived in a remote small town there once and always thought it would make a great setting. But most of my novels, while they always contain romance to one degree or other, are mostly supernatural adventure or rural as opposed to urban fantasy, with a helping of actual history. I’ve written a time travel trilogy called Time in Yellowstone, and my current series is called Tales of the Unearthly Northwest, about a ghost town that comes back to life. Why? I’ve always been interested in what happens outside our normal perceptions, and that includes falling in love. Hot tea. Plain black tea, with a squirt of lemon, no sugar, no milk, no anything else. I’m not a big music listener. I mostly listen to audiobooks, and I’ve re-listened to two series, the Vorkosigan series by Lois McMaster Bujold, and the Amelia Peabody series by Elizabeth Peters, multiple times. They’re old friends. Plotting is my bȇte noire. Making sure I’ve caught all the trails I’ve laid and tidied them all up at the end. Right where I am, on the rainy side of the Cascade Mountains here in Washington state. I am an avid reader. I’m a big fan of romance, adventure, the supernatural, history, history of place and event, and, most of all, novel series where the characters grow older and change over the course of the series instead of staying static. Lots of weird places. I explained where Much Ado in Montana came from. I got the idea for my Time in Yellowstone series when, while watching a geyser, the thought “wow, wouldn’t that make a terrific time travel device?” popped into my head. The first Tale of the Unearthly Northwest story, Sojourn, came about because of a roadside historical marker and an old plaster pig in a ghost town storefront window. I’m currently planning a novel set on a steamboat in Puget Sound after learning about the Mosquito Fleet. My ideal reader likes history, the spooky, playing with time, and ordinary people dealing with extraordinary things. S/he also likes a good love story, and a happily ever after. I’ve always wanted to be able to fly. I used to have dreams about flying over an old New England town in the autumn, buzzing the church steeple and the schoolhouse, and swooping through the trees. Hmmm… I wonder if I could make a story out of that? My next book is the second Tale of the Unearthly Northwest, Reunion, which will be out around Thanksgiving. Claudia Ogden is, or was, a schoolteacher in Seattle at the turn of the last century who, through no fault of her own, finds herself without job or resources. In desperation, she takes a position in a remote little town in the mountains, only to find out that her new home is as much at the end of its rope as she is, in ways she never expected. Happy to have you, M.M. Be sure to come back to read more about M.M. and MUCH ADO IN MONTANA, on Wednesday’s Karen’s Killer Book Bench. Happy Reading! I enjoyed reading about M. M. Justus….not sure this is the genre for me…bit confused about the time travel element….is it in this book? I’d be willing to give a try, though, just to see how it develops. This particular book does not have time travel in it, although some of my other books do. This one’s a contemporary romance, my homage to Shakespeare’s Much Ado About Nothing. I hope you enjoy it!